You probably drive by the Bonita Springs Rec Center all the time and had no idea that there was a disc golf course there. Yes, disc golf. It’s a little-known sport and for those looking for fun things to do it is an alternative to high impact sports. The disc golf course at the Bonita Springs Rec Center has been described as a testy courses with good variety of both long and short holes. Alternate tees on the classic course and pin placements on every hole makes these courses challenging and tons of fun. There is lots of water and obstacles. 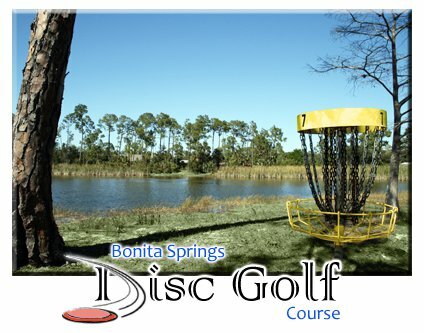 The Bonita Springs Disc Golf Course offers a handicap league every week. At the time of publication the league plays every Sunday at 9:30 AM … early to beat the heat., It’s a great way to socialize while playing with some great golfers and get a little exercise. On Wednesday nights/evenings the course offers a bag tag round ( NOT a handicap round) that starts at 6:00 PM. In the winter months when the sun goes down earlier there are games of glow golf. Bring your glow sticks and flashlights! About the disc golf course: It’s an 18 hole course and suitable for all ages. Disc golf is similar to ball golf – you throw off of a tee to a hole which is actually a basked. It takes about 2.5 hours to play and players average 1.5 to 2 mile walk while completing the ccourse. This is not your normal beach Frisbee and uses specialty discs. The Bonita Springs Rec Center is located at 26740 Pine Ave., Bonita Springs, Florida.